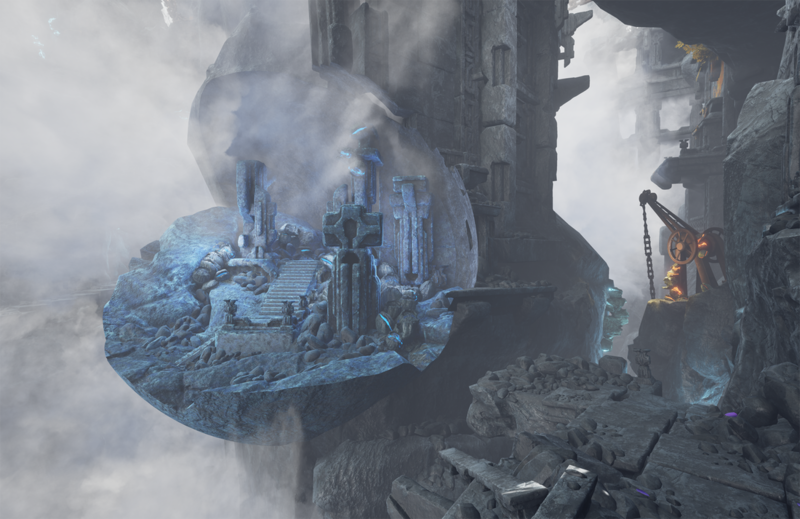 "Obduction" is a puzzle adventure game created by the makers of "Myst", in which you explore strange, beautiful worlds and uncover cosmic mysteries. 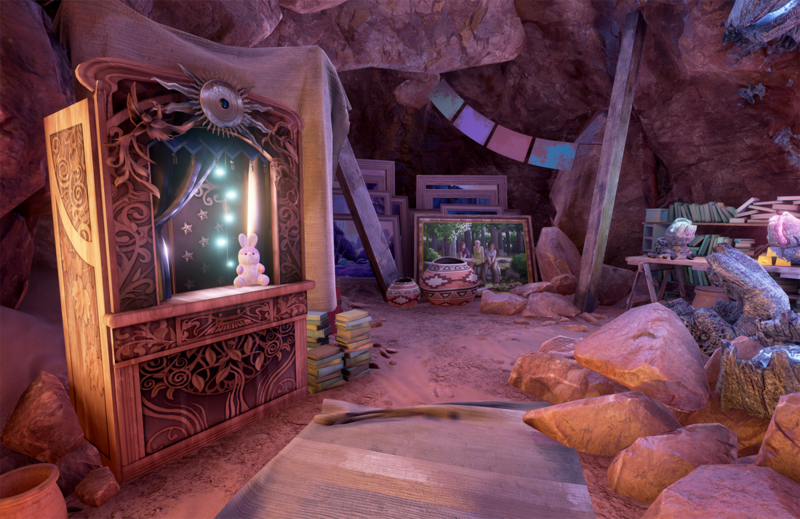 Buy Obduction on the Oculus Store. 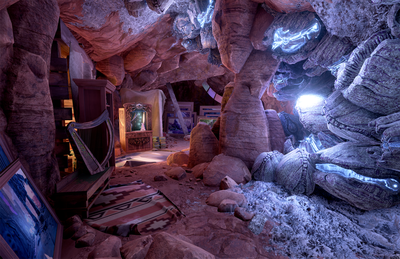 Farley's Vault is an intimate area that provides a deeper look into the searching, creative, and scientific mind of one the game's main characters, as well as insight into the game's overall narrative. 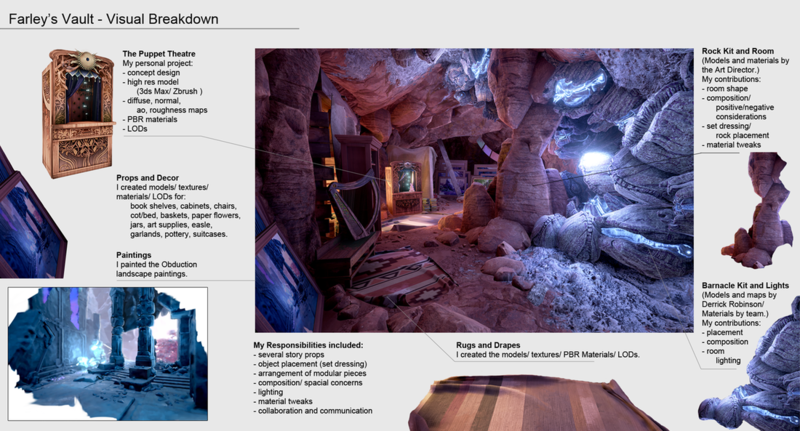 The design of this space evolved in an organic fashion from a series of conversations between the designers, the art director, the visual designer, and I.  (Rand Miller instructed me to "channel Farley".) In addition to creating several props, I was responsible for the ongoing assembly and cultivation of the space, including lighting (these screenshots were taken at the game's release). 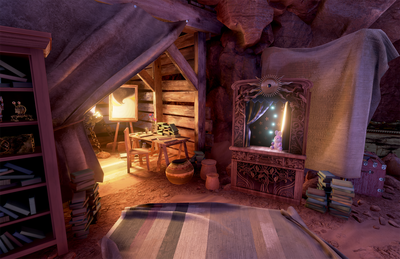 The lighting is intentionally soft and diffuse, welcoming, yet mysterious, lit by the cool blue twilight of the Arai barnacles, and the brighter warmth of Farley's sleeping quarters/ art studio. 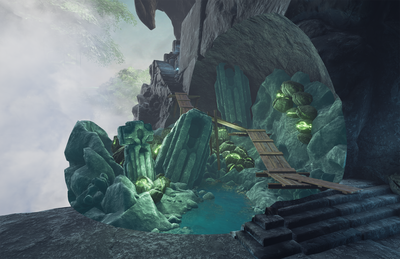 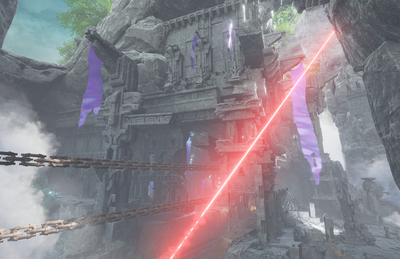 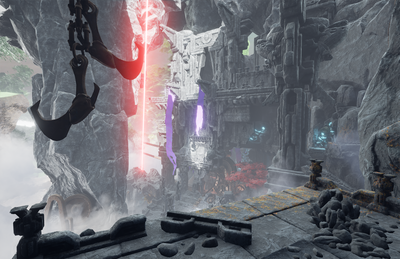 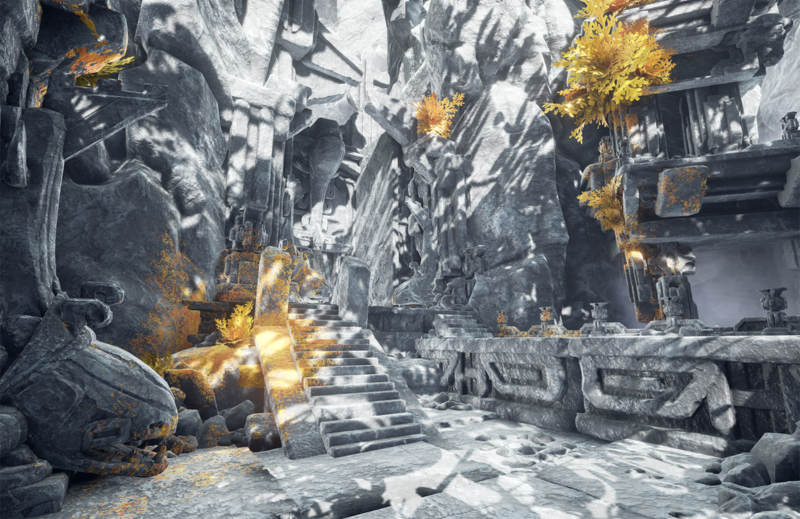 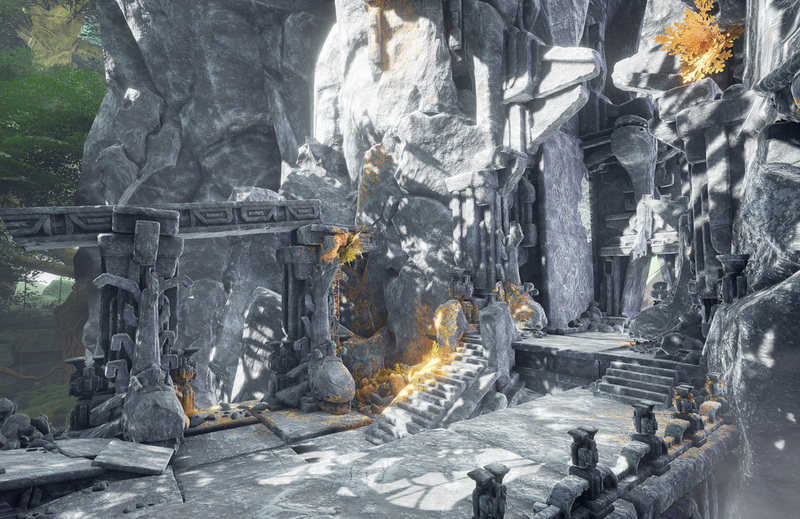 Kaptar, the second world of Obduction, is defined by soaring grey cliffs and the remains of two ancient civilizations. I developed, sculpted, and modeled most of the modular toolkit for the more ancient, peaceful civilization. 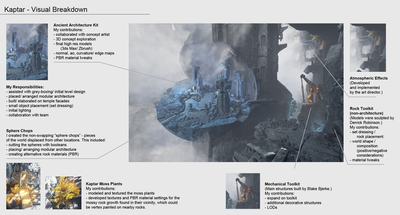 The ruin designs were derived from concept art provided by the visual designer and input from the art director. 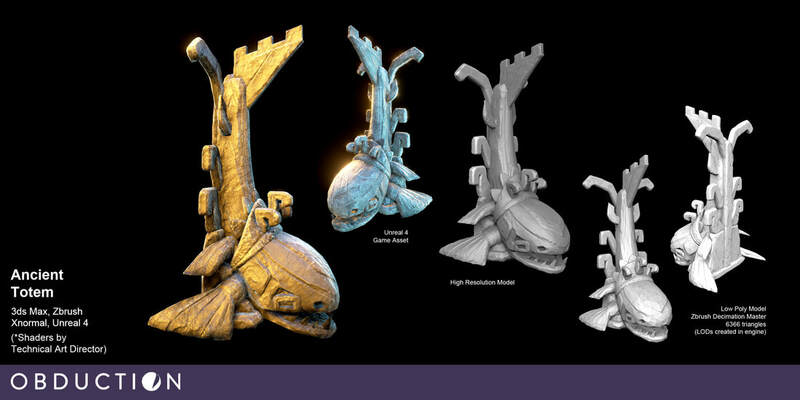 *The totem sculpture was an elaboration on the preset visual style, built from a concept I proposed to the team. 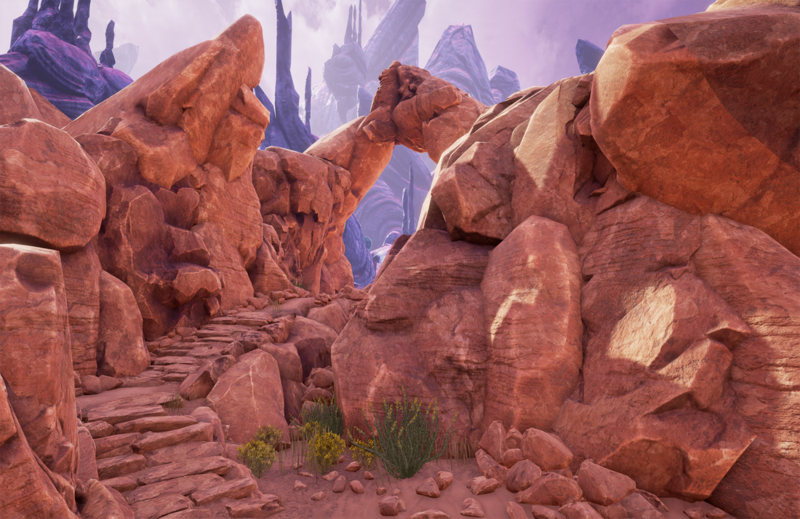 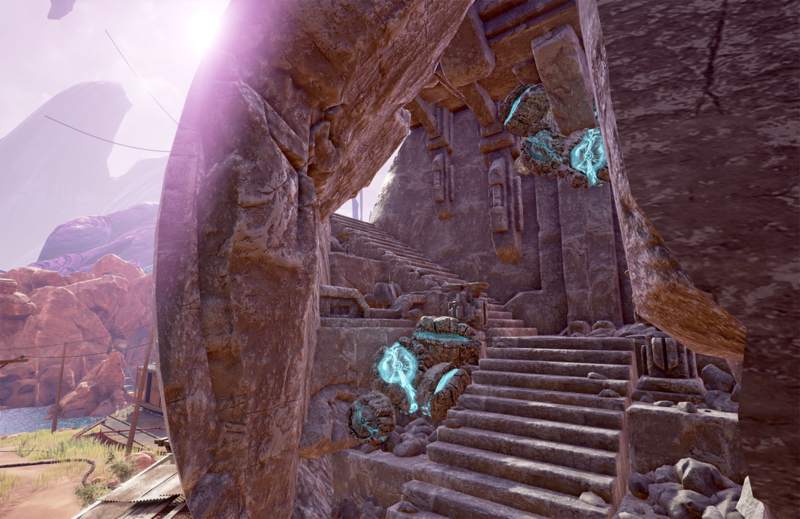 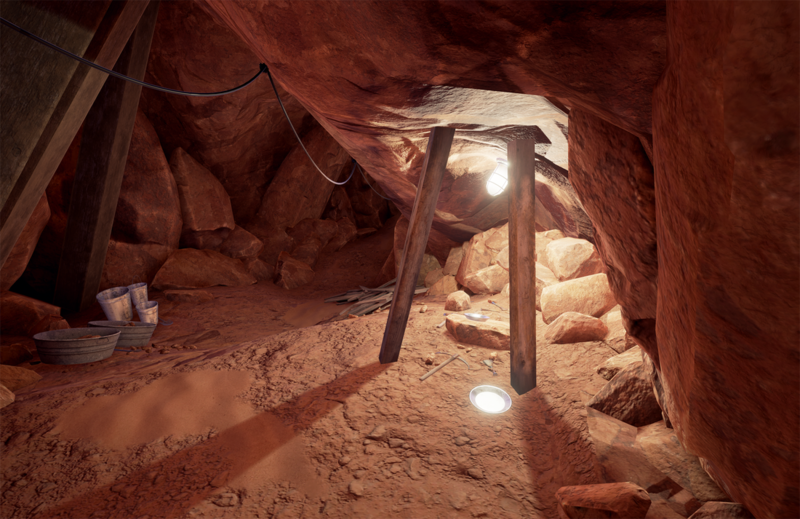 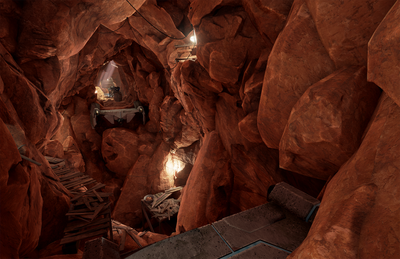 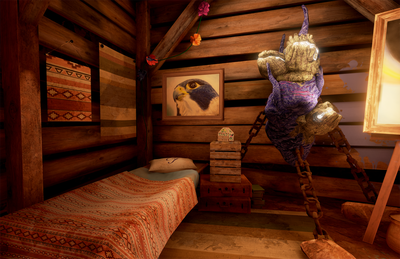 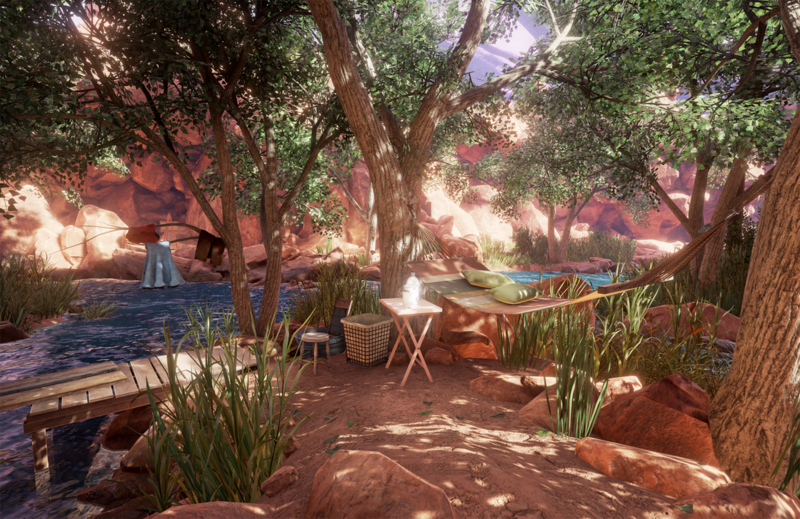 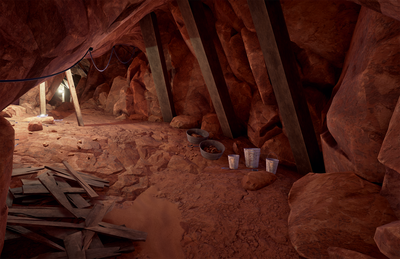 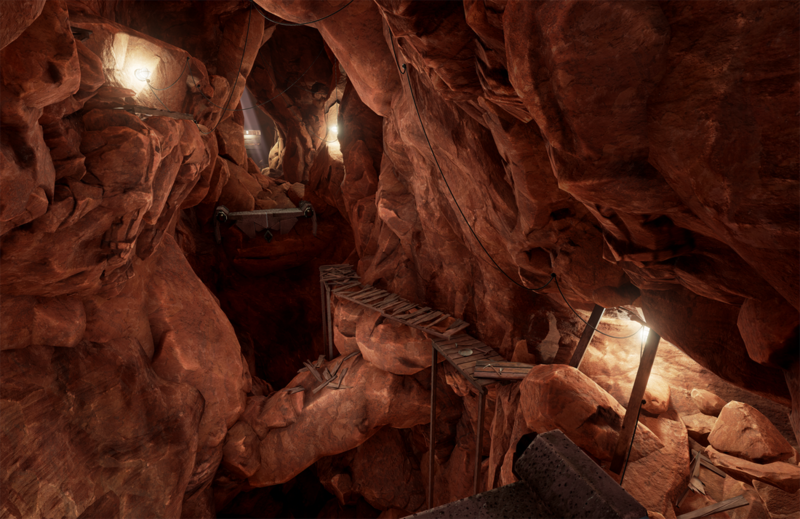 Since Obduction was funded on Kickstarter, the budget necessitated a tight deadline for the project. 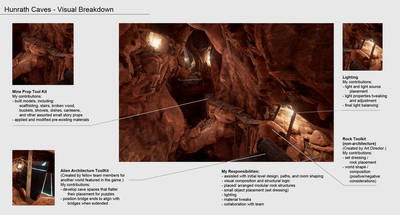 Our workflow prioritized speed. As I ramped up to the process, I was knocking out several of these structures a week. 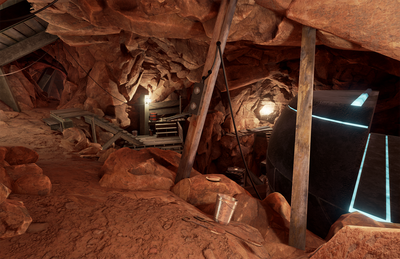 The base shaders were developed by the art director, the PBR materials were a team endeavor. 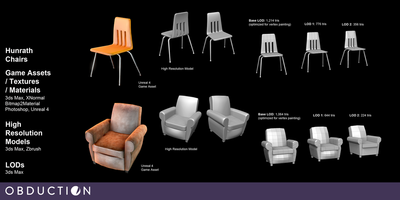 I was deeply involved in the assemblage and spacial design of Kaptar. I expanded on the original greyboxing of the world, especially the set-up of the temple areas. 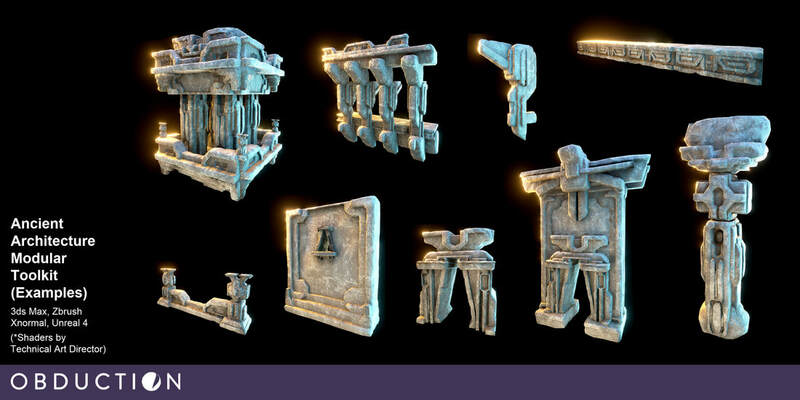 As mentioned previously, I built most elements of the ancient stone civilization. And after the visual designer defined the key spaces and contours, I was responsible for critical level art and polish passes, including mesh placement and initial lighting. 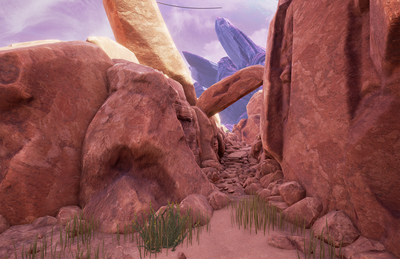 My goal was to find a sweet spot between player readability (clear paths) and visual interest. 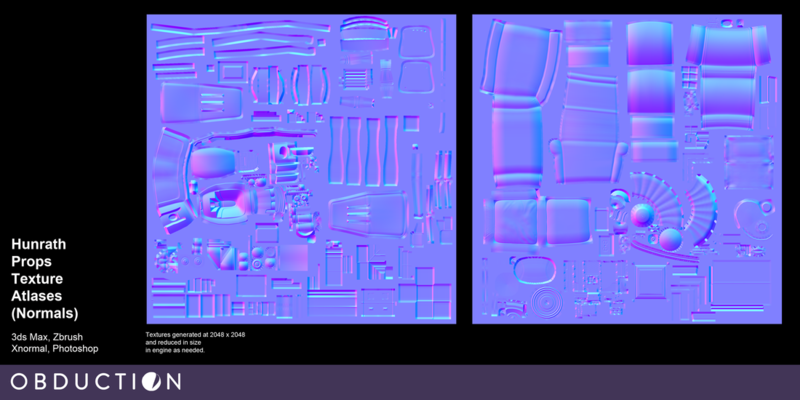 ​Lastly, the Kaptar non-swapping sphere chops were my designs, using materials I developed from project shaders. 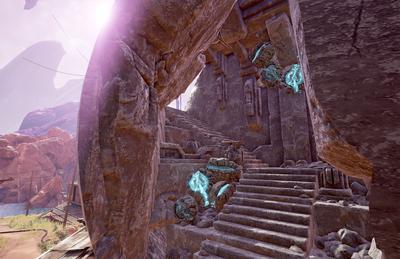 The first world, Hunrath, is essentially a piece of earth that has been abducted/obducted into an alien world. As a result, most of the structures and props of Hunrath were built from real-world research and photo reference. 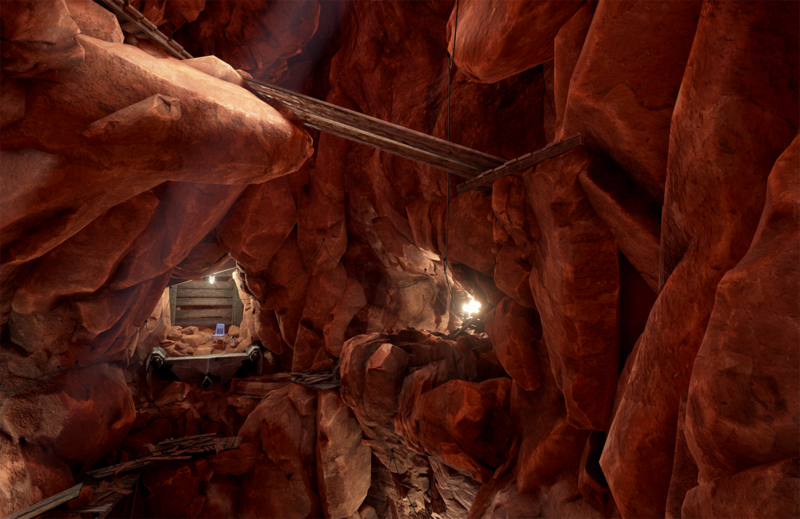 Once again, speed was of the essence. These props were created using a couple of different approaches. 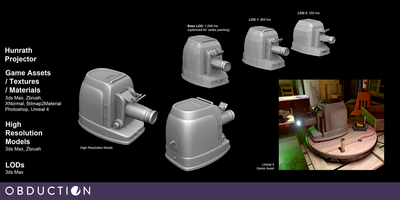 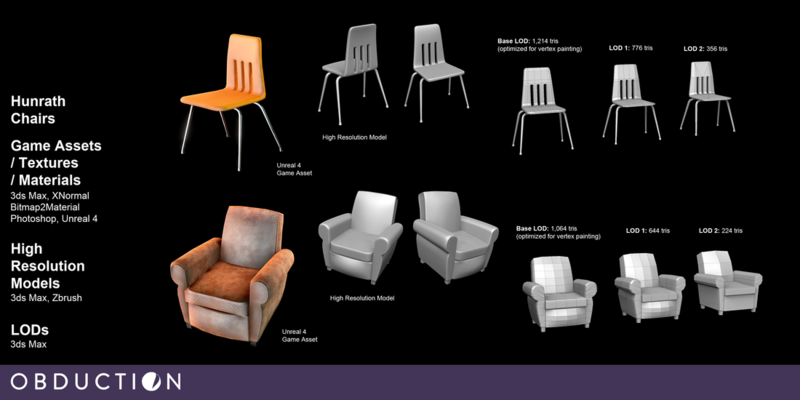 ​Some models were created using a conventional high resolution game art workflow, beginning with high poly models created in 3Ds Max/ Zbrush, from which normal maps were derived. 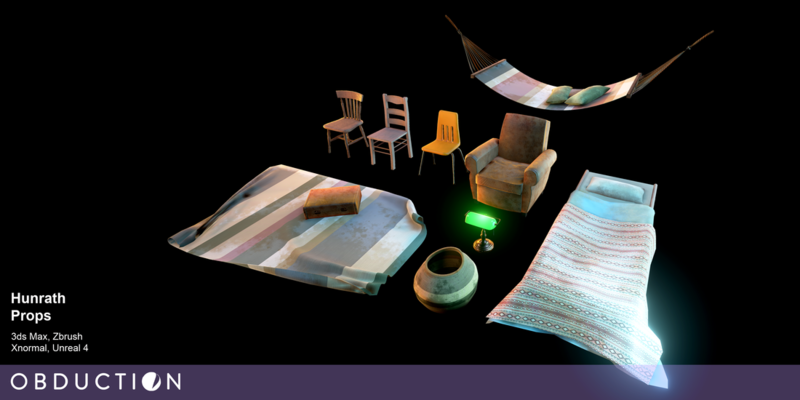 Of the props I constructed this way, I was also the author of their original materials. 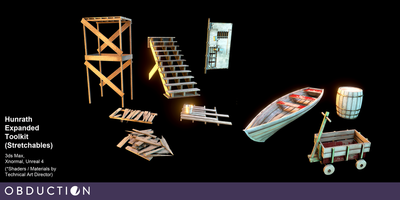 ​Others were built from a previously provided toolkit of simple stretchable structures, such as planks, that were already equipped with reusable normal maps, made possible by the design of our project's shaders. This approach allowed us to generate many real world props with similar component parts very quickly. Like the caves, I was responsible for transforming the upper cliffs and back paths of Hunrath from rough geometry into intriguing outdoor areas that lure the player deeper into the puzzles. These paths arose from a careful consideration of composition, form and silhouette, using the pre-developed Hunrath rock toolkit, terrain system, and foliage library. 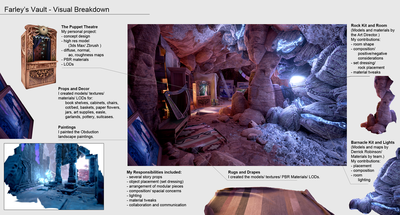 There was no pre-existing concept art for these paths, so these scene considerations were almost entirely my own. 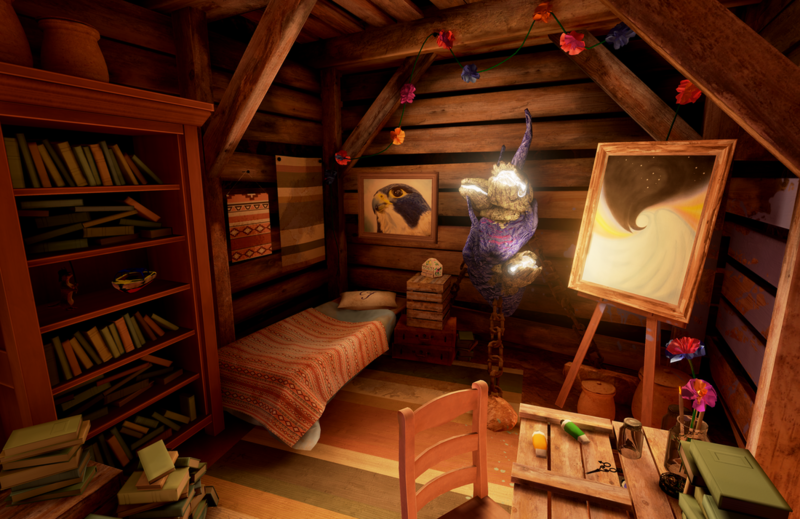 I also spent some time in the wooded bosque, where I was given the opportunity to add richness to the world of Hunrath by arranging story props (some of which were my own creation) into intriguing vignettes. 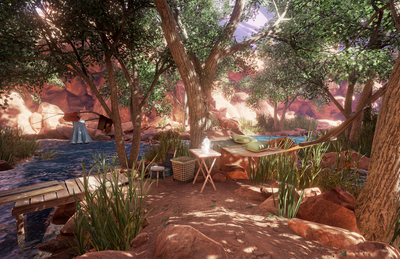 I also had some control over the outdoor lighting, through tree (shadow) and fill light placement. Finally, you can catch a glimpse of my handiwork in Kaptar (ancient architecture and level art), inside the large grey sphere swap that sits near the center of Hunrath.